Mini instruction paper included, they are easy to assemble and simple to hang. Features metal hook for easy hanging. Latest and most stylish decorative accessories. Perfect for birthday, wedding, party and other celebration occasions. Smart choice of children DIY, children can draw and write what they like on it. They are Great for kids Creative ability, imagination. 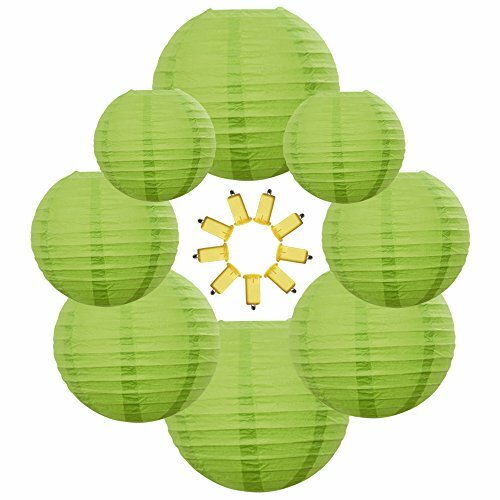 Click for more Chinese Paper Lantern Colors & Sizes! They are not waterproof, do make them stay away from water or beverages. Package includes:2 x 12" Lime Green lanterns; 2 x 10" Lime Green lanterns; 2 x 8" Lime Green lanterns; 2 x 6" Lime Green lanterns; 9 x Warm White LED lights. ENVIRONMENTAL MATERIAL: Hand-made Work with Eco-friendly Rice Paper and Quality Metal Frame, Features Metal Hook for Easy Hanging. CONVENIENT AND REUSABLE DESIGN: Convenient Collapsible Design Allows for Compact Storage When Not in Use, Making It Reusable. STYLISH DECORATIVE ACCESSORIES: Perfect for Birthday, Wedding, Party and Celebration Occasions. A Smart Choice for DIY. If you have any questions about this product by NEO LOONS, contact us by completing and submitting the form below. If you are looking for a specif part number, please include it with your message.